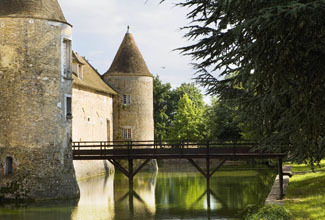 Although built in 1642, the château sits on the remains of a 13th-century castle. Its medieval owners were the Maizelan family, notable among them one Pierre de Maizelan, a knight of the realm who fought alongside King Louis at Chinon in 1240. In 1360, one of the lords of Maizelan was sent to England as a hostage to ensure the surrender of Count de Montfort under the terms of the Treaty of Brétigny. By the 17th century, Claude de Bullion, Superintendant of Finances during the reign of Louis XIII, took possession of the estate. His son, Claude, inherited and rebuilt the present château. The French Expressionist painter Bernard Buffet lived here from 1971 to 1979. Many guest rooms are located in La Fresnaye annex away from the main building. Although the exterior looks in keeping with the historic château, the rooms are generic in décor, which rather defeats the purpose of staying in a château hotel. However, if you plan on taking advantage of the hotel spa, there is direct access from this outbuilding. If you stay inside the château, you’ll have to walk outside for the spa—something to consider during the winter months. Rooms are quoted with two different rates: one for just the guest room and the other for if you’d like access to the spa. If you’re not interested in a hammam, indoor swimming pool, or fitness room, you can skip this add on. Villiers-le-Mahieu is 45 km west of Paris. From A14, exit Orgeval and continue on D45 through Maule, Thoiry, and straight to Villiers-le-Mahieu. A car is the most practical way to get here. The nearest train station is 6 km away (and an expensive taxi ride). Bus service is limited. On site: spa; tennis, seasonal swimming pool; boating on the moat; golf practice area. The château can host receptions. Inquire hotel for details. If you want to get outside of Paris and wander about in a stunning setting, Château de Villiers-le-Mahieu may offer just what you’re looking for. Set within 21 hectares of woodland, the approach to this château is a knock out with its surrounding water-filled moat, bridges, and turrets. Unless a wedding is going on, the only sound you may hear is that from the resident ducks. This is the place to come for quiet walks in beautiful gardens. If driving, you’ll need to park some 200 meters off site after dropping your luggage, but don’t worry, a cart will whisk you from the car park to reception. No two guest rooms inside the château are alike, although all are spacious and modern in décor with variation in the color schemes. Views overlook the wooded grounds. Bathrooms are modernized. The château does not offer room service. There is a formal, modern restaurant on the premises, which you’ll need to book in advance. For a quick sandwich or omelette, order at the bar.